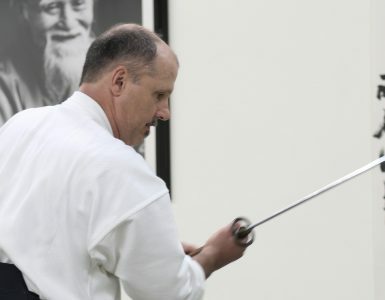 The New York Aikikai’s Yoshimitsu Yamada Shihan promotes an orthodox standard of basics in his aikido teachings, books, and videos, yet maintains a flexible balance within the diversity which makes up the United States Aikido Federation. 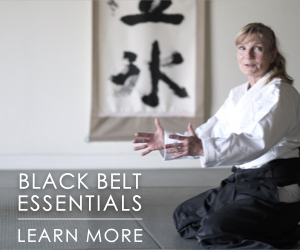 In this second of two parts, he reveals how he is able to accomplish this, and offers his thoughts on injuries, training in Europe, and the many aikido people he has known. Sensei, would you talk a little about how you approach teaching? How do you handle the beginning level of instruction? In my dojo normally we have all mixed classes. The beginners come, they pay attention. If I’m teaching, I’ll just ask someone to give them some help doing the basics. When you first went to America, do you remember that list of 50 techniques that Tohei Sensei had? You were already in the States when that was the basis of what we were supposed to teach. I didn’t follow his teaching method. The Hombu Dojo has, especially in the last ten or twelve years, changed its system too, and simplified the curriculum. Lots of techniques have been eliminated from the basic core. What is the main body of techniques that you like to teach? It may have changed a little, but basically I still follow the way I learned, the way I practiced when I was at Headquarters under Doshu. Actually I see similarities between you and Saito Sensei in style. You think so? It’s because I like the orthodox way. When I was at the Hombu, I liked Saito Sensei’s movement and technique. I didn’t study under him personally or directly, but I attended his class. I liked his dynamic movements. I try to maintain an orthodox standard. I don’t want to create anything myself. I don’t want my students to get confused when they attend someone else’s class. I believe that as long as they have a standard of basics they won’t be confused. Unfortunately, some students, when they go take another shihan’s class, don’t know what to do at all. I’ll never forget, one time we had an instructor’s seminar in California, and one fellow who had been to Japan taught a technique according to the way about five different teachers taught it. I wanted to see his style. I believe you later published a second book and you’ve recently done a video. That was a big hit. Everybody wanted it, although it is only an introduction. They want me to continue with a series. It was done professionally and everyone has complimented it. If someone reading this article wanted to order it, how would they do it? They can order directly through the federation office, via Susan Wolk. She’s the secretary of the USAF. The way we run our federation, as I have said, is very loose. We have the US Aikido Federation as an umbrella, to present ourselves to the International Aikido Federation. But actually our activities are divided into four divisions because of the size of the country: the East Coast, Midwest, California, and Hawaii. Fortunately, each division has a shihan. I am in the East Coast, myself Kanai and Sugano. In the Midwest there’s Akira Tohei, and in California. Chiba. I just leave Hawaii people alone, because it is too complicated there. We operate regionally and we don’t bother each other. Before, when there were no other shihan, I had to take care of everything. Now, each region has a shihan, and I have to respect their ways. The USAF as a body is very flexible, and it has no regulations; it’s just a big umbrella. The federation itself has no power. It just handles transactions and communications to Headquarters. What have you found to be the most effective means of communication? Each region publishes its own newsletter, and then we exchange. We put Chiba’s schedule in ours, and we exchange announcements of big events, such as summer camps. It’s working pretty well. For the day to day business we don’t bother each other. I know Chiba has his own way, Tohei Sensei has his own way. But because the East Coast is the site of membership and the financial operation, it is still kind of the head office of the entire Federation. We combine things to a certain extent; for example, Susan Wolk is the secretary of the USAF as well as secretary of the East Coast region. 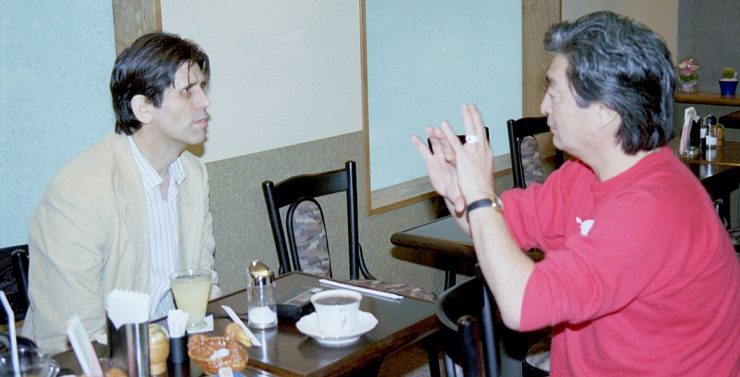 I know that two or three years ago, you had Seiichi Sugano Sensei come from Belgium. He first went to Australia back in the 1960s, I believe. 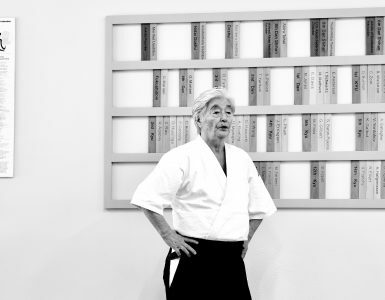 He pioneered aikido in Australia and then moved to Belgium and was hired by the Belgian Aikido Federation. He was also working as an assistant for Tamura Sensei. He had to travel an awful lot. One day one dojo, the next day another dojo. He just went. He was paid by the Federation, so he had to follow the Federation’s schedule. I just asked if he wanted to come to New York. We were always close to each other; he was like a brother to me. I’m sure you needed help. Sure, I could use him. It’s tough for two shihan to survive in one dojo, especially in New York City, but we can manage. He still goes to Australia regularly, twice a year, and he still goes to Belgium three or four times a year. We just coordinate our schedules. When I’m out he tries to stay in New York; when he’s out, I try to stay in New York. So it’s working pretty well. The New York Aikikai has got a good technical reputation. Thank you very much. It’s got a good reputation both technically and for its atmosphere. As a matter of fact, many European people come to my dojo, and I always welcome them. They don’t have that kind of dojo in Europe. It’s something new for them. We have good practices five or six times a day, and good practitioners. It’s pretty popular. I invite people and I have a kitchenette so they can stay and cook. It’s really family style and open to everybody. My students are nice to visitors, and they end up good friends. You instituted an uchideshi system, fairly early, I think. Could you describe that a little bit? Yes. I don’t have regulations for uchideshi, but I do it because I grew up that way. Angel Tineo was my first uchideshi because he was a little kid, going to school, and his parents were back home in the Dominican Republic. So that’s how I started. If anyone wanted to stay, I said fine. Do they teach some classes for you? Yes, of course. I now have three, although one currently is in Japan. So there are now two permanent ones. But some people come just for a month. Anyone is welcome. You are still a young man, but you’ve got a lot of experience under your belt in the United States, especially on the East Coast. 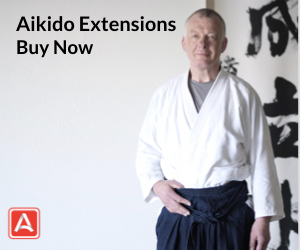 Do you have some dream or something special you’d like to accomplish, or some new direction in which you’d like to take aikido? My dream is to buy some land somewhere in upstate New York, and just keep it for the members, so they can come spend weekends. Have some live-in students, do some farming. Just like Iwama in the old days. You’ll probably have to wait until you’re 90 years old before they’ll let you go! I’d like to have a second facility big enough to hold summer camps, or intensive classes. That’s my dream. Other than that, the only thing I’d like to ask of my students is for each instructor to take more responsibility for what he is doing. Some people start teaching too soon. When this happens, he wants his students to see only his teaching. Even though a high-level person’s technique may be poor, when I see them at summer camp, I say, “Oh that’s fine, but just follow my style for now.” I don’t want to see that kind of separation. Each instructor should take more responsibility to polish his skills so that his students can develop. 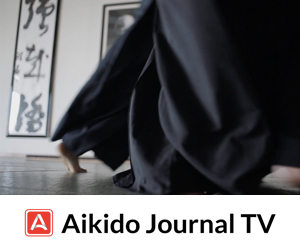 Again, aikido should be individual and creative; that’s part of its beauty, and it is why there are some problems. About three years ago, Hombu Dojo recognized Saotome Sensei’s group back into the organization. Is that completely separate from the organizational standpoint from the USAF? Yes. We just don’t bother each other. It’s just between Doshu and Saotome. Can members between the dojos practice freely together? I don’t mind if my students go to a seminar, but I think they refuse to go by themselves. But as far as I am concerned anyone is welcome to come to our seminars. You began visiting Europe fairly early, didn’t you? I go quite often, because I am invited by Tamura Sensei. You have quite a close personal relationship with him? Tamura Sensei and I grew up together. I respect him a lot, and I learn a lot. As a teacher I have to learn, not just for myself, but for the benefit of my students. I want my students to be able to go anywhere without embarrassing themselves. If they go to Iwama, they can practice, they can adjust; if they go to Tamura Sensei, they can adjust. That’s my intention. 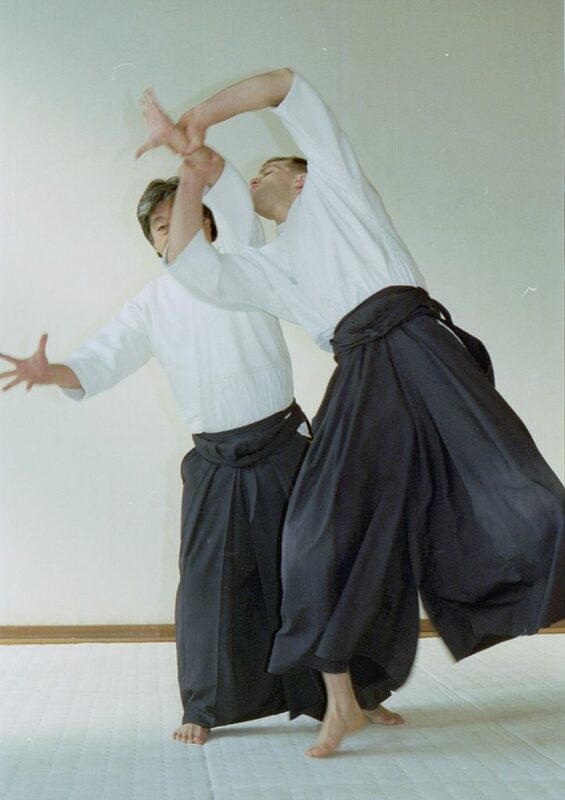 What are some of your impressions of French aikido? There are many countries in the world, but there’s only one France. You know they have more practitioners than Japan now, I’m certain. They’ve got somewhere around 2,500 to 3,000 dojos. They’re lucky because they’ve got facilities. Every small town has nice public facilities. So it’s very easy to organize seminars. Because each town has a gymnasium run by the city, each town has nice tatami. In the United States getting the tatami is the biggest problem. Renting a big space takes money. That’s why in Europe, and especially France, aikido has grown so fast. Of course, many people like budo, but it is mainly I think because of the facilities. It’s so easy to organize a class, anywhere. They all use the vacation for attending seminars and summer camps. They love to travel. They are lucky too because everyone has five or six weeks of vacation. Sensei, there’s another quite interesting subject, and Japanese don’t understand this very well. For example, in aikido every once in a while a dojo will have a person who trains in a very rough way, and he injures people. 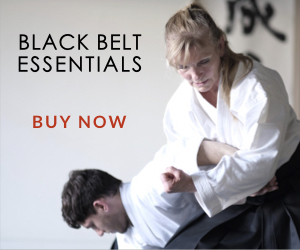 In the United States, if you’re running a dojo, you need to have various kinds of insurance, injury insurance, etc. Even if you are not present, as the head of the dojo you are financially and legally responsible. In the States people speak out when they get hurt. In Japan, if they get injured they hold it in. But in the U.S., you never know if they’re going to sue you individually, as a dojo, or any other way you can name. Have you had to do anything to protect yourself from that kind of danger? You have to understand that practicing and being brutal are different stories. I don’t mind if people study hard, reasonably, walking the edge. They are still doing budo. But unnecessary brutality, I can never forgive. If a guy starts doing that, I just have to tell him to stop. But as for protection, it is difficult to have complete protection. We have them sign the waiver but I found out that means nothing, except in court. If there is an injury, your approach is important. You have to be sorry and apologize and pay the doctor’s bill. That’s all. But some people are nasty. Then the person who was injured gets mad and takes some kind of action. But if you approach them nicely and say, “I’m sorry it happened,” as the chief instructor, and send them flowers, then they’re fine. If you approach them differently, and say, “It’s your own fault. You should have expected that kind of thing. What do you think you are studying?” then they get mad. That’s the only protection I have. To be generous. I’ve been in Japan now for over fourteen years, and I’ve been injured a couple of times. There are a few people who are specialists and who’ve injured hundreds of people. I am against that. To use aikido to damage people is not fair. The ideal is based on cooperation when you practice. I understand how I feel personally, but I never could understand how the person in charge of the dojo could allow those people to keep behaving that way. In my dojo it would kill my business. I tell them not to do it. I need the money for everyone to have a place to practice. You have to see it from the business point of view too. 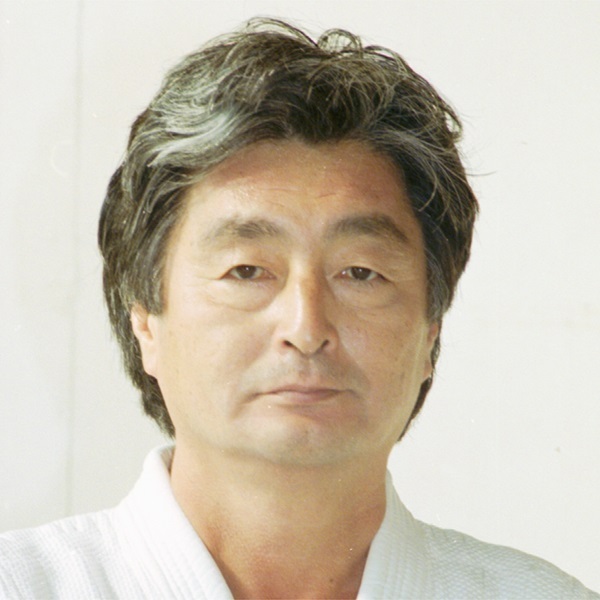 When O-Sensei would teach, were there very many injuries as a result of his techniques? I didn’t witness any of that kind of injury. That’s pretty much what I have heard. I never saw such a thing. Of course, there were accidents. But not that kind of intentional thing. Is there any statement you’d like to make or any strong message you’d like to communicate? As a old-timer, I hate to see the family togetherness being lost, but by the same token, as aikido grows, many people become involved. We may dislike each other, but there’s no reason to fight. We might have different points of view, and that’s fine. But we should work together. No matter what people say, everyone can make a contribution from a different angle. That’s the nature of aikido; aikido has been approached by many different people from different fields and they all have their own backgrounds. That’s the problem we have in aikido, but again it’s the good point too. 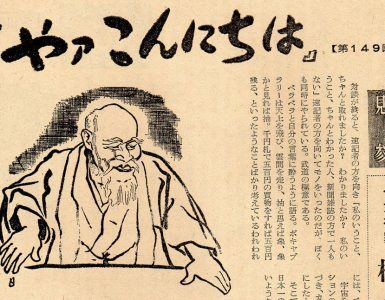 Even in O-Sensei’s time, there was the Tempu-kai approach, the approach from Sakurazawa, from Mr. Tomiki, judo, etc. If you think of it, aikido itself is an offshoot of Daito-ryu. That’s the nature of aikido. I apologize for waiting so long to talk to you. I’ve been in Japan so I just don’t get a chance to see you. Thank you for spending time with us. I’m glad we had this opportunity.